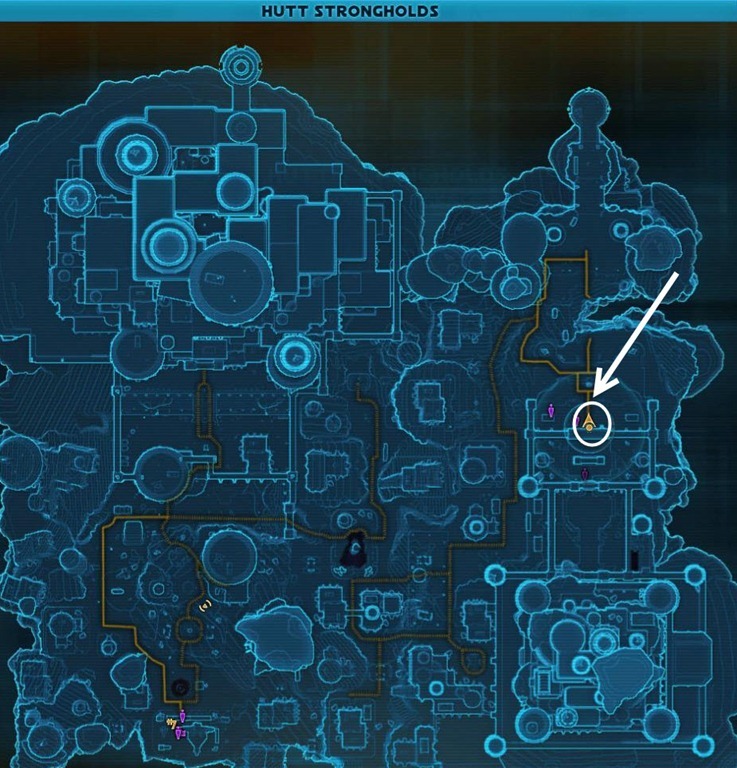 A guide to defeating Golden Fury, a new operation/world boss guide on Makeb located in Toborro’s courtyard. 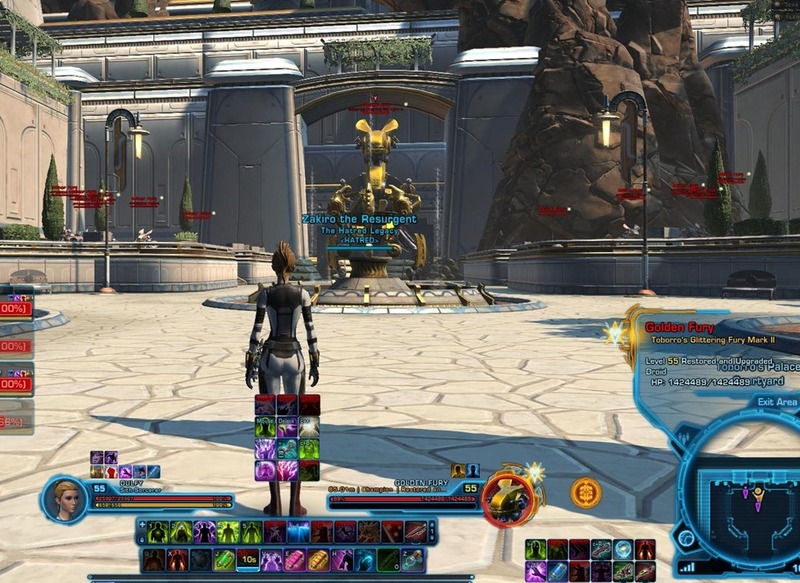 Golden Fury is inside an instance called Toborro’s courtyard in Hutt Strongholds/Archon’s Estate (north most island). 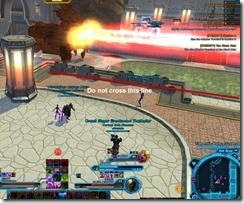 Republic players will be more familiar with this area since this is a Republic questing area. 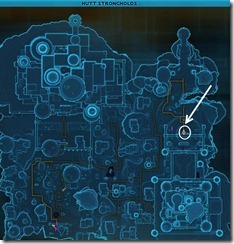 This is a (8m/16m) operation boss with weekly lockout that reset on Tuesday morning. There are separate lockouts for storymode and hard/nightmare. There is a weekly quest to kill Golden Fury on any difficulty that rewards 6 Ultimate Comms.and 12 Elite Comms. 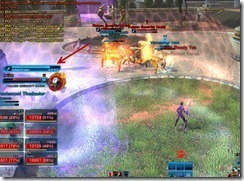 Storymode can be done by L55 players in Dread Guard (recommended gear rating is 156). Frontal cleave: Golden Fury has a frontal attack so you will definitely want to turn him sideways, away from the entrance. 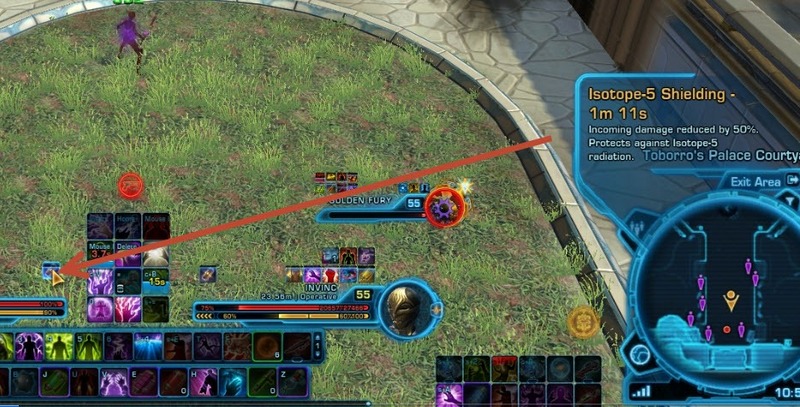 This allow your DPS to stand in the middle to damage both the boss and adds without worrying about getting cleaved. Isotope Release: Tank only mechanic, this is a big blue circle placed on the tank that deals a ton of damage. Healers need to make sure the tank is topped off. Usually comes a few seconds after every Massive Laser. 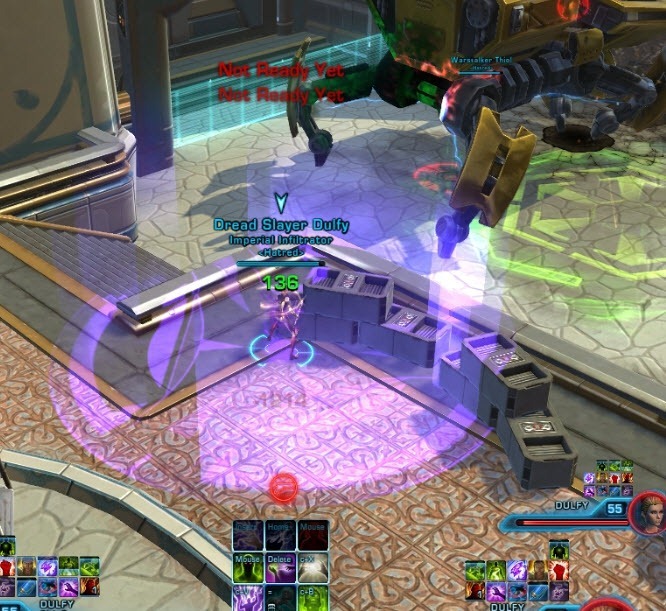 Satellite Strike: This attack will target a random raid member (purple circle) and drop a satellite attack on them that deals 3.6k damage per tick for 3 ticks (unavoidable). This is quite a bit of damage so make sure raid members call out if they are low on health and get targeted by this attack. Massive Lasers: You will hear the alarms ringing well before this attack begins. It is a massive laser beam aimed at the middle of the instance. It takes 8 seconds to charge up but anyone caught in it will mostly likely die. Make sure you are well on the sides when this attack arrives. 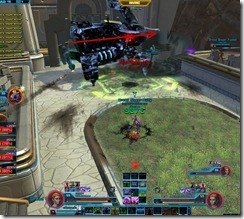 Droid Adds: Two Droid adds will spawn right after Massive Lasers and they always spawn in the exact same spot. Offtank can grab them while the DPS focus on getting them killed. Healers will need to switch back and forth between both tanks to recuperate the damage from Isotope Release and the droid adds. They have about 31k HP each on storymode. Radiation Leak Phase 2 starts when Golden Fury reaches ~19. Golden Fury will cast an ability called Radiation Leak that give him a buff. It increases his outgoing damage and causes periodic area damage. You can counter this by destroying the Isotope-5 containers on either side (4 on each side for 8m). Doing this will give you a buff that lasts for 1 minute 30 seconds that reduces all the incoming damage you take by 50% and protect you from the radiation damage. These Isotope-5 containers will respawn after 2 minute 40 seconds. There are no differences between hardmode and nightmare mode at this time. Hardmode/Nightmare will require a bit better gear than Dread Guard. You will probably need some Arkanian/Underworld items so you have enough DPS to help meet enrage. This fight is quite long and mistakes are not easily tolerated. 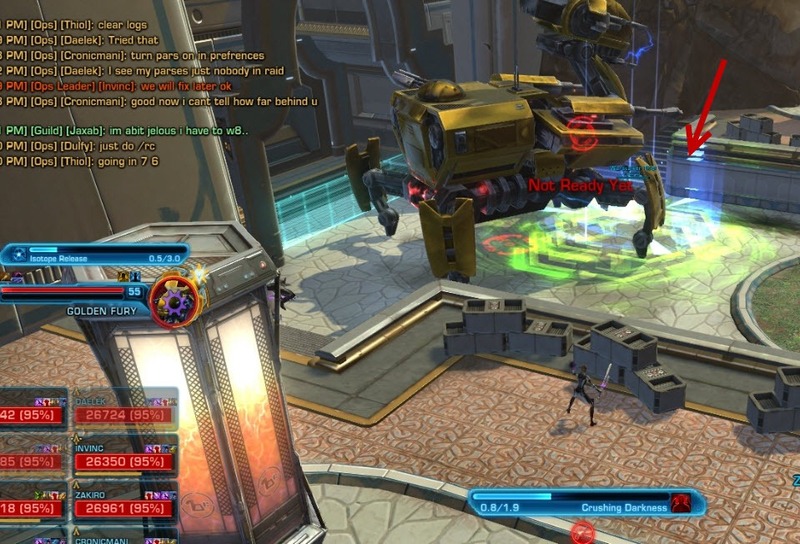 Missing a single interrupt or moving a second slower can mean the difference between a wipe or a kill. Loot: any Underworld piece (random), 6 Vial of Stabilized Isotope-5, 3 Exotic Element Equalizer, 2x Pleasure Speeder Subspace Music Transceiver (component for GSI reputation speeder), 6 Ultimate Commendations and 8 Elite Commendations. Rewards the title [name] the Furious. Isotope –5 Containers: Due to the high damage output on hardmode, both the maintank and the add tank will need to get the buff from Isotope –5 containers that reduces damage by 50%. All of the containers should be damaged pre-fight so tanks can quickly receive the buff with a single hit. DPS will need to help damage respawned Isotope-5 containers (~8k HP). Main tank can grab the containers near the boss while the add tank can grab containers near the entrance. The buff from each container lasts about 2 laser/add cycles. 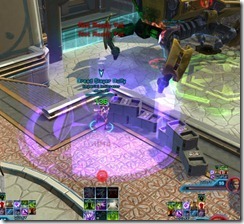 Laser Charge: After each Massive Laser, Golden Fury gains a stacking buff called Laser Charge that reduces the time it takes to charge up Massive Laser. This buff goes up to a max stack of 8, which reduces the charge up time to 2.0 seconds (each stack shave 0.5 seconds off the charging time). This means that at the beginning of the fight, Massive Laser takes 6 seconds to charge up but near the end of the fight, the Laser only take 2 seconds to charge up. It definitely helps to have a raid member call out when the lasers are coming so everyone has time to move to the sides of the room. Security Droid adds: Both droid adds have an attack called Isotope-5 Laser that must be interrupted (3 seconds cast time). If they hit the tank with this attack, they will stripe the Isotope-5 container buff from the tank, resulting in much higher incoming damage. One tank and a ranged DPS should be sufficient to deal with the adds while rest of the DPS focus on the boss (ranged DPS is better for interrupts). Radiation Leak and Enrage: At 20%, when Golden Fury casts Radiation Leak, everyone can pretty much stack behind the Golden Fury boss and do as much DPS as you can. If Golden Fury enrages, his Isotope Release or Satellite Strike attacks will most likely one shot players (tanks may be able to survive one Isotope Release if they use their defensive cooldowns). The fight on normal 8-man does not have the Minor Furies, and only had 2 adds each time, they must have changed it from the PTS. We divided the raid in half, 3 on each side, while tanks rotate. That way, we could stay far away from each so we could just heal through the damage from the purple circle, and only move when he did the an energy sweep of the central corridor which also hits a small area up the top. Tanks tanked near the right side stairs (with the rocks), and could then just run up when the energy beam was about to be cast. Also, we got a random Black Market Purple, an Unassembled Arkanian token, and a purple item part for a speeder. Just killed this on live. We got an arcanian headpiece and a music component for the mount trade-in. Anyone know what the weekly for this guy gives? Mechanics on 8M SM were different. No cleaning or debuff. Adds were two bigger droids in the middle of the CY. Adds did massive dmg. Had two mars get isotop shields and dps them down as with shields you are invincible. Also during heavy laser EVERYTHING in the middle of the entire room was insta gibed. Tanks and melee dps had to evac up the steps. Also we got the elite OH token. You are great as usual. I know things are really changing at the moment but according to the swtor web site your drop list needs some updating. 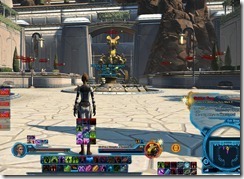 It claims story mode drops Arkanian loot and hard mode drops Underworld loot. It wouldn’t surprise me if you are right and they are wrong but I thought I’d bring it to your attention. This is not even the same as on live servers.. 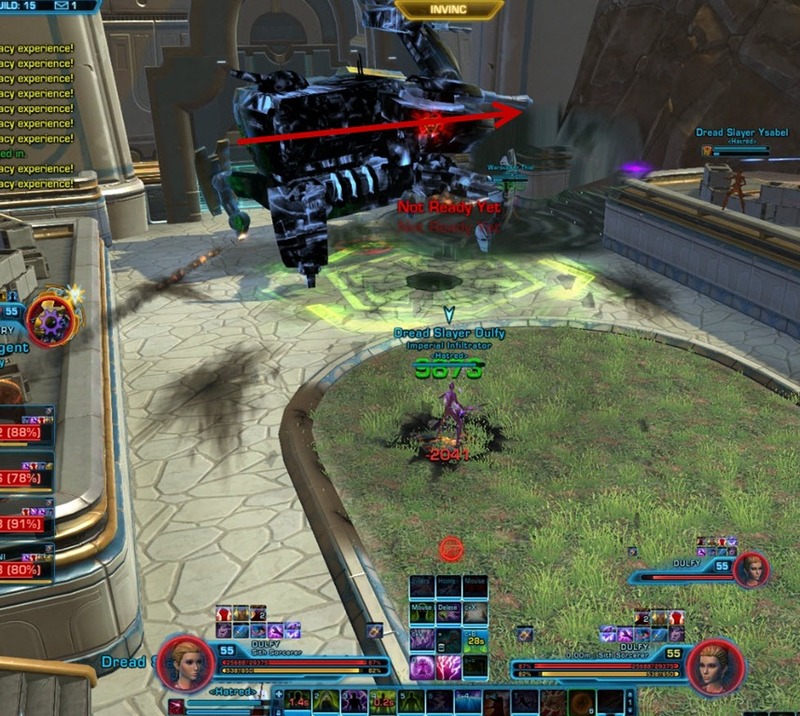 I did just do this in a 8 man group, and nothing was the same as this guide showed us so we just jumped on him and avoided the damage, killed droids and downed the boss! yes I updated it with the new mechanics. Is there a gear Req? do we need mostly stuff from the basic vendors (gear/relic wise)or can the classic gear cut it? Dread Guard is enough for storymode. If you don’t have dread guard then grab some pieces of Basic gear helps. Thanks! 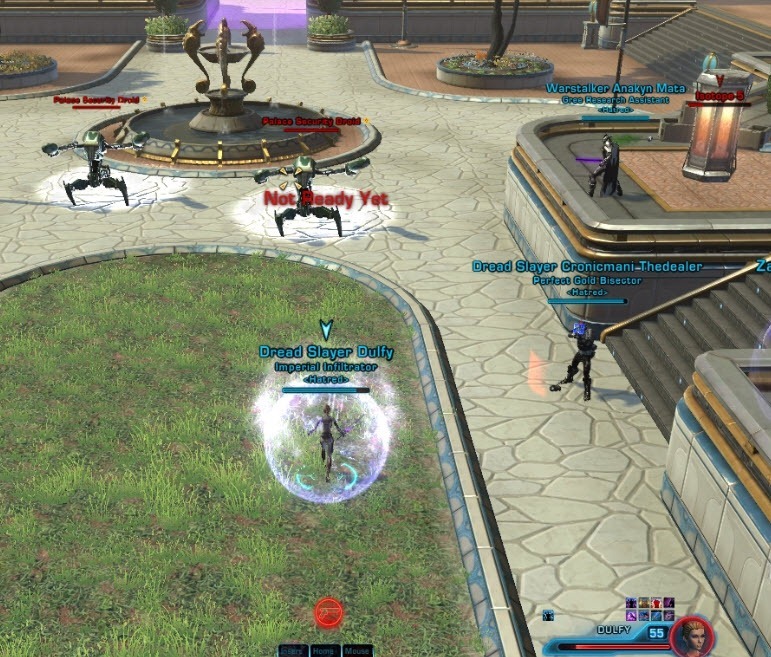 I’ve been needing a reason stop leveling alts for Makeb and go back to my main Jedi Knight after doing all of Makeb, well I also am working on S&V , so now i have to reasons lol! Love your guides; Awesome Work! Just wanted to let you know that my group received the Arkanian boots token after defeating this on story mode. Just thought I’d let you know! The canisters can be moved with Force Push/Grappling hook to get them in better position for the tanks. Handy to have all 4 in one area for ease of access to tanks for hm. 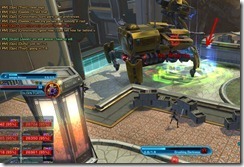 We killed it on April 14 and the xpac was released for early access on April 9. Most of us were in full dread guard with some arkanian/underworld so yes it is definitely doable. Are you having trouble with DPS or incoming damage? 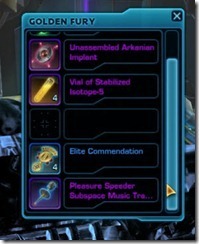 you need underworld equivalent gear 168 for melees full set with the implants and lightsabers and all to do this ops or augmented gear to that gear rating. Of course doing it 8 man cuz 16 man is very unbalanced arkanian is less than that its for scum and villany and terror from beyond(recomended).as tick of gear can mean the big difference. Our guild just killed him on HM with just one tank. We had to figure out a new tactic and it worked great, but I was wondering in the video it shows 1 tank and 1 dps take down both adds b4 laser? we had 2 dps on them on and we barely made it. Yes we used only 1 dps (sniper) and a tank on the adds in our kill (we use orbital strikes from other DPS when they are up). When we run this with alts we find it sometimes necessary to have two DPS on the adds but that is risky for the enrage. Hey Dulfy. Any chance you know if there are any differences for this fight in 16man for any difficulty? Also, hate to ask but do you know a good resource for 16man fights? Ok, so my guild has been attempting this in Hardmode. I am a mara in 69/72’s pulling 2500+ dps rest of the dps is pretty similar geared pulling 2200 dps. We have two dps sorcs who cannot seem to get the adds down. Im wondering what kind of dps your one sniper was pulling? Something to note that I noticed and it helped with people not derping (especially HM), is that Satellite strike hits twice between each Massive Laser – once right after it goes off and once RIGHT BEFORE it goes off. 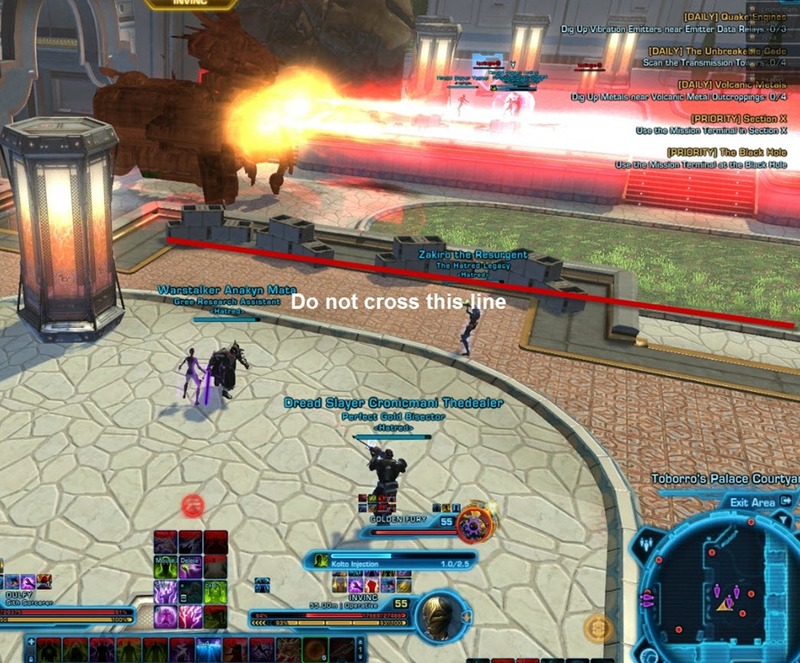 Healers can easily time the satellite strike and warn the raid “Massive Laser in 5 seconds gtfo.” Saves lives. Why do people keep saying you dont need isotopes in SM? Every time I run TC SM, the isotope containers are left alone. The damage you take in storymode isn’t a big deal, and can easily be healed. Still, i think it’s an nice extra safeguard to use/advise HM tactics in any SM op-when practical-especially if you’re a newbie healer or tank (like moi). Besides, it gives new people extra practice for Hard and Nightmare without the pressure of having people get mad at you if you don’t catch on quick enough and wipe. Yea, I concur, when I use the Isos when I tank, I always get yelled at… even though my tankking is fine. It is a nice safeguard, I’ll agree with you 100% there. My groups tend to use HM tactics in most SM ops and the CZ tacticals (not DPS burning Duneclaw or Kephess, for example) for this reason. It just seems like the majority of people I run TC with have the mentality mentioned above – if it isn’t doing much damage, why bother in SM. I will say it is good if you’re with a group that wants to teach HM mechanics, though. Seriuosly…why would I play an MMO to group!?! NEED MOAR SOLO! 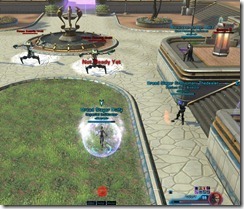 What’s the HPS you should have in this fight on StarParse?